Fit patients, defined as normal creatinine clearance and low co-morbidity score (go go), and without 17p deletion or TP53 mutation should receive FC-Rituximab as front-line therapy. Treatment naïve patients who are not able to tolerate full-dose FC-Rituximab and with CIRS score of <6 now qualify for Bendamustine as first-line treatment through the special authority scheme. Obinutuzumab, a second generation anti-CD20 monoclonal antibody, is also approved for use in combination with chlorambucil in patients who are not able to tolerate full dose FC-Rituximab, have CIRS score >6 and/or CrCl <70 mL/min and are obinutuzumab naïve. Patients with relevant co-morbidity (slow go) should be treated with chlorambucil or dose-modified FC to achieve symptom control. Patients with symptomatic disease and del(17p) respond poorly to FCR and should be considered for alternative first line therapy, e.g. high dose methylprednisolone ± rituximab, alemtuzumab and allogeneic transplantation. Ghia, P. and M. Hallek (2014). "Management of chronic lymphocytic leukemia." Haematologica 99(6): 965-972. Shanafelt, T. (2013). "Treatment of older patients with chronic lymphocytic leukemia: key questions and current answers." ASH Education Program Book 2013(1): 158-167. Schnaiter, A. and S. Stilgenbauer (2013). "17p deletion in chronic lymphocytic leukemia: risk stratification and therapeutic approach." Hematol Oncol Clin North Am 27(2): 289-301. It should be noted that the recommendations for 1st line treatment and beyond in NZ are influenced by the economic availability of drugs. In Europe the most commonly prescribed treatment for non-intensive patients is bendamustine-rituximab, and chlorambucil is used by less than 10% of haematologists. Similarly, in the relapsed setting the most commonly used drug in Canada is ibrutinib. Ibrutinib is not funded in NZ at the time of writing. This is the simplest treatment and generally well tolerated although neutropenia is common at higher doses (see below). The overall response rate varies between 30-60% according to the individual regimen, but there are few complete remissions, and progression-free survival and time to next treatment is usually shorter than alternative regimens. No benefit has been shown for the addition of prednisone (unless there are auto-immune cytopenias) or for different regimens, e.g. continuous v. intermittent. Some example regimens are given below. Chlorambucil 10 mg/m2 PO daily in single or divided doses for 7 days repeated every 28 days until maximum response, or if partial response for 9-12 months was used in the UK CLL4 study in which the overall response rate was 72%. Chlorambucil 0.1 mg/kg daily may also be given on a continuous basis as used in a French Cooperative Group study. (The French Cooperative Group on Chronic Lymphocytic Leukemia. (1990). Blood 75(7): 1422-1425.). A short course of oral steroids has been recommended by some for patients with stage C disease before chlorambucil (grade C, level IV evidence). Metoclopramide 10 mg TDS PO as required. Allopurinol for first two courses. For further information, see the Data Sheet on Medsafe. 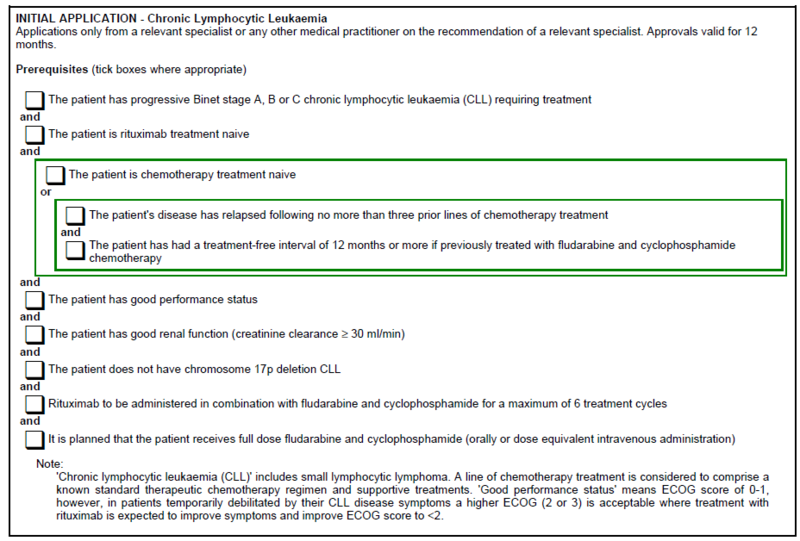 For avid readers wanting a comprehensive review of the use of chlorambucil in CLL see Goede, V., et al. (2014). "Past, present and future role of chlorambucil in the treatment of chronic lymphocytic leukemia." Leuk Lymphoma: 1-8. Fludarabine and cyclophosphamide have been shown in three randomised controlled trials to result in more complete (24-38%) and overall responses (70-95%) than fludarabine alone (6-15% and 50-83% respectively). In younger patients quality of life was not worse on FC v F. Overall survival was not different between the two groups. Older patients are likely to tolerate the combined regimen less well with a higher rate of infectious complications. Fludarabine 25 mg/m2 plus cyclophosphamide 250 mg/m2, both given IV as infusions in 100 mL of 0.9S over 30 minutes daily, for 3 days, for a minimum of 3 courses and a maximum of 6, in order to achieve optimum response. See O'Brien, S. M., H. M. Kantarjian, et al. (2001). J Clin Oncol 19(5): 1414-20. Note: Cyclophosphamide should be infused immediately before fludarabine for optimal effect. Either: Fludarabine 24 mg/m2 and oral cyclophosphamide 150 mg/m2 daily for 5 days (see Dearden, C. E., S. Richards, et al. (2010). Cancer 117(11): 2452-2460). Or: Fludarabine 30-40 mg/m2 and cyclophosphamide 200-250 mg/m2 for 3 days (see Cazin, B., M. Divine, et al. (2008). Br J Haematol 143(1): 54-9 or Laurenti, L., L. De Padua, et al. (2011). Ann Hematol 90(1): 59-65). Note: If patients wish to take the tablets in divided doses, it is recommended to take the cyclophosphamide tablets at breakfast time and the fludarabine tablets at lunchtime. Antiemetic therapy will be required. Start with metoclopramide PO 10-20 mg TDS or cyclizine 25-50 mg PO BD or TDS. Consider reducing dose fludarabine in elderly. eGFR <30 mL/min. Consider reduced dose if eGFR 30-60 mL/min. Cardiac disease is a factor (discuss with Consultant). The patient is pregnant or at risk of pregnancy. There is a history of severe infections. There is a history of auto-immune cytopenias. See below for dosage modifications, adverse effects and supportive needed. For further information, see the Data Sheets on Medsafe. Irradiation of all blood products for at least a year (see Irradiated Blood form). PCP prophylaxis (co-trimoxazole 480 mg daily) from the start of treatment and continued for six months after therapy ends. Bendamustine was compared to chlorambucil in a randomised trial. As a single agent, it produced improved responses but greater toxicity and no OS benefit. The overall response and median progression free survival was 67% and 22 months for bendamustine versus 30% and 8 months for chlorambucil. More recently bendamustine has been combined with rituximab (BR) as a first-line therapy for patients with CLL. In head-to-head comparison with FCR, the median progress free survival was 41.7 months for BR and 55.2 months with FCR. The number of patients achieving MRD negativity was also higher for FCR than BR. However, FCR was associated with more severe neutropenia and infective complications (84% vs 59% and 39% vs 25% respectively), especially in patients >65 years of age. Therefore, FCR remains the standard of care in young fit CLL patients, but elderly fit CLL patients may benefit from this as an alternative regime. Obinutuzumab is a humanised anti-CD20 monoclonal antibody that was initially investigated in patients with relapsed/refractory disease where overall response rates of between 30–60% were observed. Based on these results, Obinutuzumab in combination with chlorambucil (O-CLB) was compared to rituximab and chlorambucil (R-CLB), and chlorambucil (CLB) alone in previously untreated patients. Treatment with O-CLB resulted in increased response and prolonged progression-free survival (PFS) compared to R-CLB and CLB (PFS 26.7 months vs 11.1 months vs 16.3 months respectively). Also improved OS compared to CLB alone. The most common side effect with O-CLB are infusion-related reactions and neutropenia. Cartron, G., et al. Obinutuzumab (GA101) in relapsed/refractory chronic lymphocytic leukemia: final data from the phase 1/2 GAUGUIN study. Blood 2014, 124:2196-2202. Hallek, M. (2017). Chronic lymphocytic leukemia: 2017 update on diagnosis, risk stratification, and treatment. Am J Hematol. 2017; 92: 946-965.